A footpath runs through farm to join the woods down to the beach onto the Wales Coastal Path. 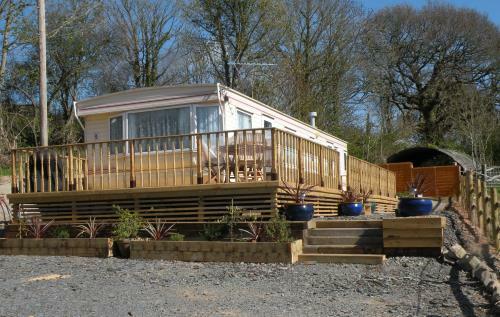 There is a wraparound newly installed wide timber deck with railings and gate making this an ideal caravan for a family with children. This Caravan has the luxury of double glazing and central heating. The caravan has 1 shower room and WC with basin and an ensuite double bedroom and twin room. There is also a pull out double bed in the lounge. The kitchen is fitted with a full size gas cooker, a microwave, toaster and fridge freezer. The kitchen also has plenty of crockery, glassware, cutlery, and cookware for family meals. All beds have duvets and pillows with all bed linen provided but guests must bring their own towels. In the lounge there is a 24" flat screen TV with free view and built in DVD player. Comfy wrap around sofas seating 6 (including a sofa bed with bed linen provided) and dining area seating up to 6. Gas fire in lounge area also radiators throughout the caravan. There is off road parking for one or more cars close to the caravan, and plenty of space for kayaks and water sports equipment. Short breaks available by arrangement, 3 night minimum.